The past month has been tough for many farmers. Frequent, heavy rains have caused increased disease and crop loss, varying from farm to farm based on crops and soil type. When you shop at farmers’ markets or choose local options at your grocery store, you’re helping farmers weather these storms so that they can keep bringing us delicious, locally grown food. Our support, as consumers and neighbors, is vital to the survival of local farms, but it’s not enough to solve some of the biggest challenges facing local agriculture. Changing the way we spend our food dollars has a lot of benefits, but all by itself it’s unlikely to address complex issues like climate change and food insecurity. Federal policy, on the other hand, impacts the big picture. Two of this summer’s biggest news stories, immigration and trade policy, both have direct impacts on farms. Today’s food and agricultural status quo — the ubiquitous presence of corn syrup and soy byproducts in our diets, the growth of enormous dairy farms in parched regions, the presence of skilled workers from Latin America who fled their homes due to disruptions caused by United States trade policy and military intervention — are the results of policies we put in place. We can’t solve these problems as consumers, but we can address them as advocates and citizens. The federal Farm Bill, passed by Congress every five years, is due for renewal on Sept. 30. This legislation has enormous impacts on both farmers and on some of the most vulnerable U.S. residents. Since its inception in the 1930s, the Farm Bill has included both farm support and anti-hunger programs. The pairing has an underlying logic, acknowledging that the fundamental reason to maintain strong farms is to feed people. In the past, it has also ensured that urban and rural legislators work together to create legislative policy that works for their constituencies. The Supplemental Nutrition Assistance Program (SNAP), formerly known as food stamps, accounted for almost 80 percent of the planned spending in the last Farm Bill. One in every nine Massachusetts residents receives SNAP benefits. In other words, the Farm Bill helps our neighbors weather metaphorical storms, as well as the kinds that bring torrential rain. Major farm support programs — commodity crop subsidies, crop insurance and conservation —account for about 20 percent of projected total spending in the 2014 Farm Bill. There’s about 1 percent left over, and it funds programs especially useful to farms here in New England, such as those supporting fruit and vegetable producers, organic farmers, local markets and beginning farmers. Earlier this summer, the House and Senate each passed versions of the Farm Bill. What comes out of conference committee — and whether that joint bill can garner enough votes in each chamber to pass — will set the course for both farm policy and one of our major safety net programs. The big disagreement between the two Farm Bills is over SNAP benefits. The House bill tightens existing work requirements for SNAP recipients, making it harder for them to ride out job fluctuations or illness, while the Senate version leaves SNAP largely unchanged. Other differences between the two bills are also important — for example, how they treat those 1 percent programs that help farmers here in New England. Several of those programs are cut in the House bill but strengthened in the Senate version. In 2010, the Farm Bill funded a pilot project helping farmers build plastic “hoop houses,” the caterpillar-shaped temporary greenhouses that now dot our farm landscape. Since then, Farm Bill funds have built nearly 300 hoop houses in Massachusetts, and they’ve allowed farmers to extend their production into the spring and fall and to grow crops that otherwise might succumb to disease in a climate now marked by heavy rainfall. Hoop houses are one reason we still have local tomatoes in the marketplace this summer. Similarly, the Farm Bill funded research that led to the Massachusetts Healthy Incentives Program, which gives Massachusetts SNAP recipients an instant rebate on produce purchased from local farmers. Now funded by the state, this program allows our tax dollars to do double duty: feeding hungry people and supporting local farms. These programs represent a tiny portion of Farm Bill spending, but they show the power and promise of good government: to help us ride out the storms of life in ways that build stronger economies and healthier communities. 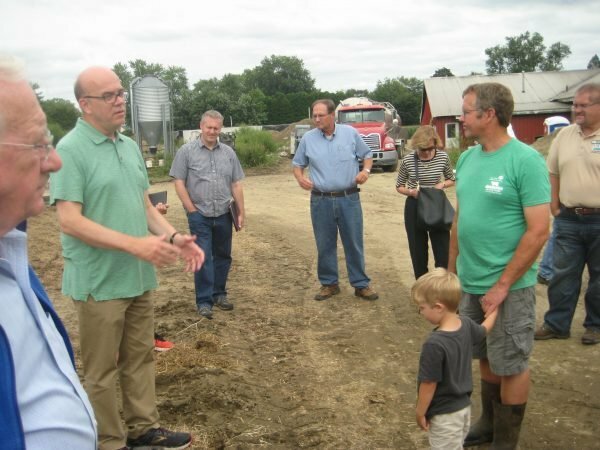 Massachusetts is ably represented on the Farm Bill conference committee by Congressman Jim McGovern, a stalwart supporter of local agriculture and advocate for the hungry. Candidates for our other congressional seat debate on WGBY on Aug. 30 — don’t forget to consider candidates’ food and farm policy positions in making your choices in the Sept. 4 primaries and the Nov. 6 general election! Our voices — and our votes — make a difference.